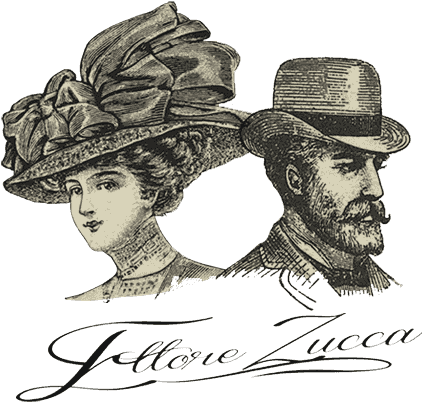 1919 – From the story of Carlo Zucca, founder of the “Rabarbaro Zucca” brand. I spent most of my childhood in my family’s workshop in the midst of the comings and goings of customers and the scent of herbs crushed in a large mortar. 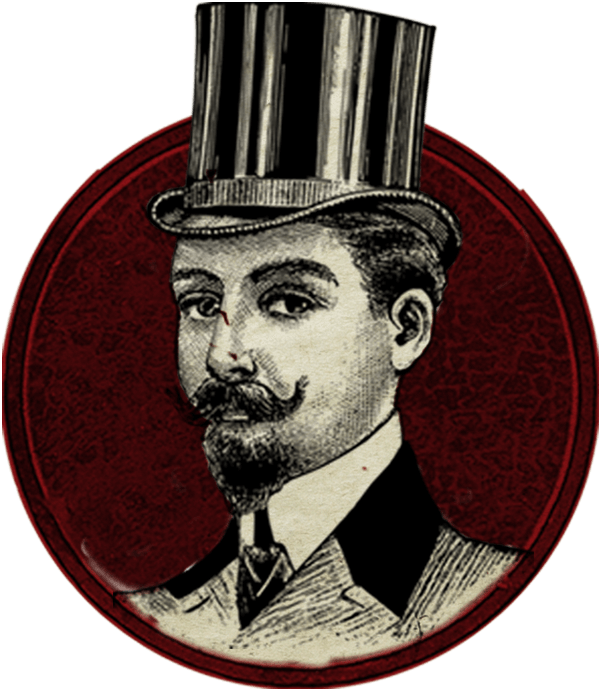 Originating from this same workshop and with my sons, Emilio and Gerolamo, I founded the industry that bears our name. I have found, in the old register held by my predecessor Ettore, a small recipe hand-written by his wife, Tilde: following her doctor’s advice, she used to prepare a special infusion of rhubarb and medicinal herbs to help her rather poor digestion. 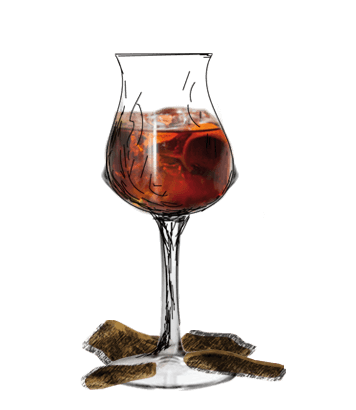 which started from my hometown of Milan as a homemade spirit and has become the signature liquor of the city’s distinguished society. is the epitome of the high life. Our cafes are a meeting place where people can enjoy pleasant tastings, where travelers from all countries can sip our rhubarb – perhaps with a splash of soda water, an orange peel, or a drop of vanilla. With great satisfaction, I have made our liquor known in Italy and abroad, as one of the finest Italian specialties. We have stood out by being awarded the highest honors at Universal Exhibitions, and we are proud of our title of the Official Supplier of the Italian Royal House. Everywhere we go, we raise the banner of our Caffè Zucca, the modern and stylish coffee bar that is so well-known in Milan. Made from an infusion of Rhubarb Rootstocks and a secret selection of rare herbs, Rabarbaro captures an appealingly delicate flavour. 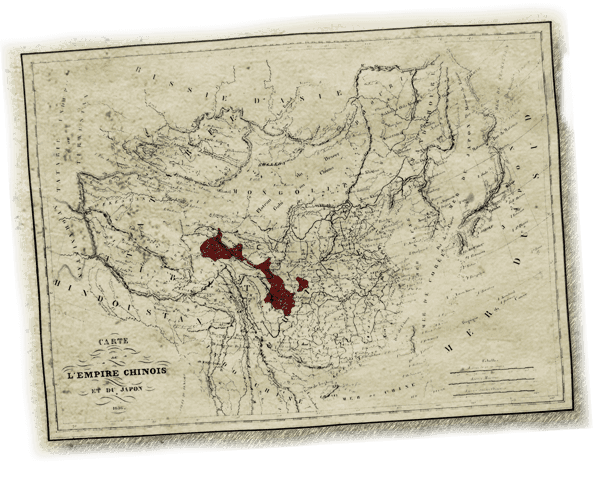 Zucca is made using the root of the true Chinese Rhubarb, which grows only in the mountainous regions of Kansu province. Source: Research conducted on a sample of bartenders from the West Coast USA and consumers during the San Francisco PR Event «Eat Drink SF». 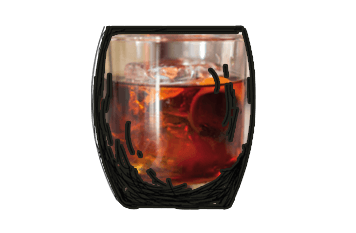 Add all ingredients into a yari glass with ice. Stir until chilled and strain over large slow melting ice cube. 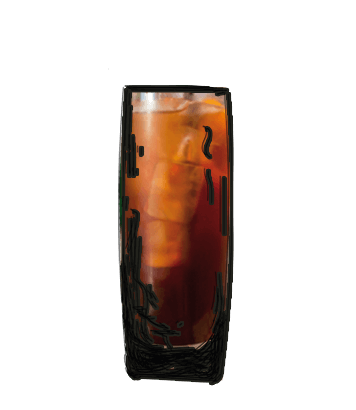 Add Zucca, sweet vermouth to a highball over ice. Top with San Pellegrino sparkling water and fresh lemon juice. 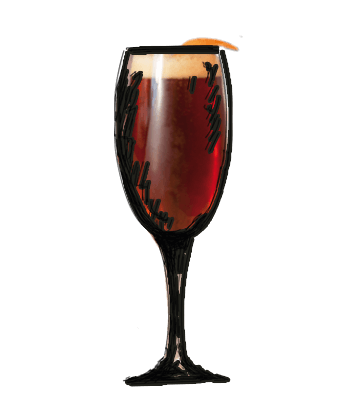 Add Zucca into champagne flute then top with prosecco followed by Pompelmo grapefruit soda. INFORMATION CONCERNING PERSONAL DATA PROCESSING – EU REGULATION 679/2016 ON PERSONAL DATA PROTECTION. In compliance with EU REGULATION679/2016 ON PERSONAL DATA PROTECTION and its subsequent amendments, we hereby provide all information concerning the processing of personal data acquired through your visit to our website. The note shall be deemed applicable exclusively to this website and no other websites visited by the user by means of links. The Controller shall not be in any way responsible for third party websites. The note is also based on Recommendation 2/2001 that the European authorities for the protection of personal data, gathered in the Group established by Article 29 of the directive n. 95/46/EC, adopted on 17 May 2001 to identify certain minimum requirements for the collection of personal data on-line, and, in particular, the methods, timing and nature of the information that data controllers must provide to the users when they connect to web pages, regardless of the purpose of the link. Processing operations connected to the web services of this site take place at Data Controller offices and are only handled by the personnel in charge of processing. The computer systems and software procedures used to operate this website acquire, during their normal operation, some personal data whose transmission is implicit in the use of Internet communication protocols. This is information that is not collected to be associated with identified data subjects, but which by its very nature could, through processing and association with data held by third parties, cause users to be identified. This category of data includes IP addresses or domain names of the computers used by users connecting to the site, the addresses in the Uniform Resource Identifier (URI) notation of the requested resources, the time of the request, the method used to submit the request to the server, the size of the file obtained in response, the numerical code indicating the status of the response given by the server (success, error, etc.) and other parameters relating to the operating system and the user’s computer environment. These data are used for the sole purpose of obtaining anonymous statistical information on the use of the site and to check its correct functioning and are deleted immediately after processing. The optional, explicit and voluntary sending of e-mails to the addresses indicated on this site, the data entry forms (form) and/or the newsletter subscription forms present on the site entails the subsequent acquisition of the sender’s address, necessary to reply to the requests, as well as any other personal data included in the message. Specific summary information can be reported or displayed on the pages of the site prepared for particular services upon request. Personal data are processed with automated tools for the time strictly necessary to achieve the purposes for which they were collected. Specific security measures are observed to prevent data loss, illicit or incorrect use and unauthorised access. • Group companies and/or companies in the business network or private parties directly involved in the performance of the service or entitled to know the data under the law. Apart from the provisions on navigation data, the user is free to provide personal data contained in the forms on the site or indicated in contacts with the Controller to request the newsletter, information material, commercial offers or other communications. The Controller reserves the right to modify, update, add or remove portions of this statement at its discretion and at any time. Data subjects are required to periodically perform checks in order to verify any changes. In order to facilitate this verification, the information includes an indication of the date of updating. The use of the site after the publication of the changes will constitute acceptance of the same. Cookies are small text strings that the sites visited by the user send to their display device, usually to the browser, where they are stored before being subsequently re-transmitted to the same websites the following time the same user visits the website. During navigation on a site the user can receive on his/her device even cookies sent from different websites or web servers (so-called “third parties”), on which some elements may exist, such as images, maps, sounds, specific links to pages of other domains, present on the site that the user is currently visiting. Cookies, usually present in users’ browsers in large numbers and sometimes even with wide temporal persistence, may be used for different purposes such as performing computer authentication, monitoring sessions, storing information on specific configurations concerning users accessing the server, etc. Cookies are divided into two macro-categories: “technical” cookies and “profiling” cookies. Technical cookies are used for the sole purpose of “transmitting a communication over an electronic communications network, or to the extent strictly necessary for the provider of an information company service explicitly requested by the subscriber or user to provide this service “(see Article 122, paragraph 1, of the Code). They are not used for other purposes and are normally installed directly by the controller or operator of the website. They can be divided into navigation or session cookies, which guarantee the normal navigation and use of the website (allowing, for example, to make a purchase or authenticate to access restricted areas); analytics cookies, similar to technical cookies when used directly by the site operator to collect information, in aggregate form, on the number of users and how they visit the site; functional cookies, which allow the user to browse according to a series of selected criteria (for example, the language, the products selected for purchase) in order to improve the service rendered to the same. Another type of cookies are the so-called “Flash Cookies” (Local Shared Objects), used within Adobe Flash Player to deliver some content, such as video clips or animations, in order to remember the settings and preferences. Flash cookies are stored on the device, but are managed through a different interface than the one provided by the browser in use. The Adobe website https://www.adobe.com/devnet/security.html provides information on how to remove or disable Flash cookies related to a specific domain. For the installation of these cookies, the prior consent of users is not required, while the obligation to provide information pursuant to article 13 and 14 of European Regulation (EU) 2016/679 of 27/04/2016, whereby the site manager, if using only such devices, can provide in the manner it should deem most suitable. Profiling cookies are designed to create profiles related to the user and are used in order to send advertising messages in line with the preferences expressed by the same in the context of surfing the net. Due to the particular invasiveness that such devices may have in the private sphere of users, European and Italian regulations alike require the user to be adequately informed about their use and therefore be able to express their valid consent. In particular pursuant to article 13 and 22 of European Regulation (EU) 2016/679 of 27/04/2016 the data subject must be informed that there are no consequences due to the processing carried out with profiling cookies. These are the cookies installed by the website that the user is visiting. They are necessary for navigation on the site, allow the use of the main functionalities and to protect the connection, maintain the session identifiers and store the information related to the authentications. Without these cookies, some or all of the website features may not be suitable for use. Below is a description of the third-party cookies that may be used by the site, as well as links through which the user can receive more information and request their deactivation. The Piwik service respects the settings of “Do Not Track”, a technology that allows users to exclude themselves from tracking the sites they visit. If the user uses a browser compatible with this technology, he/she must set the preferences to “I do not want to be tracked” (Do Not Track). The exact nature of some cookies (which, under certain conditions, could be considered “profiling”) may in the future be reconsidered on the basis of the evolution in the interpretation of the directives of the Authority: in this case, this information will be updated accordingly and any further obligations that may be required will be completed. • Persistent (persistent cookies): they are used to store information, such as the login name and password, in order to avoid the user having to type them again each time he/she visits a specific site. These remain stored on the computer even after the user has closed the browser. In most browsers cookies are enabled at the source; users can decide whether to accept them or not by using the settings of their browser. If the user has already consented but wants to change the cookies settings, he/she must delete them through the browser, as shown below, because otherwise those already installed will not be removed. In particular, please note that it is not possible in any way to control third-party cookies, so if the consent has already been given, it is necessary to delete cookies through the browser (dedicated section) or by asking for the opt-out out directly to third parties. For more detailed information concerning the cookie deactivation options, following is a list of links for the configuration of main browsers. If none of the listed browsers should be in use, select “cookie” in the Guide page of the browser in use. It is also possible to delete all cookies installed in the cookies folder of the browsers in use. Each browser has different procedures for managing settings, see the guide for the browser in use to know the procedures required to change settings and the address of the directory containing cookies. All intellectual property and database rights, in our Site, and in the materials published on it, including but not limited to trademarks, designs, logos, text, images, audio and video materials, look and feel and software (including code, interface and website structure) (“Materials”) are owned by us, our subsidiaries, affiliates companies and/or any of our partners (“the Owners”). The Materials are protected by intellectual property laws and treaties around the world. All such rights are reserved. You may not remove any copyright or other proprietary notices from any Materials on our Site. We reserve the right to copy protect any of the Materials on our Site. Except as provided in these terms and conditions, the use of this Site does not grant you any rights, title, interest or license to any Materials you may access on this Site Provided that you are located in a country or other territory where the consumption of alcoholic beverages is permitted AND you are of a legal age to consume alcoholic beverages in the country or other territory in which you are located, you may print a reasonable number of hard copies, and may download extracts, of any page(s) from our Site for your lawful, personal, non-commercial use. Unless otherwise specifically authorised by us (by way of example only, explicit instructions such as “Click Here to Enlarge this Image”) you must not modify the paper or digital copies of any Materials you have printed off or downloaded in any way, and you must not use any illustrations, photographs, video or audio sequences or any graphics separately from any accompanying text or proprietary notice. All other copying (whether in electronic, hard copy or other format) reproduction, transmission, public performance, distribution, commercial exploitation, adaptation, translation, modification, bundling, merging, sharing or making available to any person, or creation of any derivative works of our Site or the Materials on our Site is prohibited and may breach intellectual property laws and other laws worldwide. You may use our Site only for lawful purposes and we reserve the right, in our sole discretion, to terminate your use of the Site. You may not use our Site: In any way that breaches any applicable local, national or international law or regulation. We may from time to time provide interactive services on our Site including, without limitation, chat rooms and forums, bulletin boards, music mix rooms, image upload features, interactive drinks functionality and interactive clubfinder. Where we do provide any interactive service, we will provide clear information to you about the kind of service offered, if it is moderated and what form of moderation is used (including whether it is human or technical). This list only serves to provide examples and is not meant to be an exhaustive list of the types of unacceptable uses that may result in the restriction, suspension or termination of your use of our Site. All conditions, warranties and other terms which might otherwise be implied by statute, common law or the law of equity. Any liability for any direct, indirect or consequential loss or damage incurred by any user in connection with our site or in connection with the use, inability to use, or results of the use of our site, any websites linked to it and any materials posted on it, including, without limitation any liability for: loss of income or revenue, loss of business, loss of profits or contracts, loss of anticipated savings, loss of data, loss of goodwill, wasted management or office time, and for any other loss or damage of any kind, however arising and whether caused by tort (including negligence), breach of contract or otherwise, even if foreseeable. Because some jurisdictions do not allow the exclusion or limitation of liability or damages, the ILLVA SARONNO S.p.A. Group’s liability in such jurisdictions shall be limited to the extent permitted by law. To the extent you are located in the U.S., these Terms and Conditions are governed and construed in accordance with the laws of the State of New York, excluding its conflicts of law rules, and any dispute arising out of or relating to these Terms and Conditions or your access or use of this Site will be subject to the exclusive jurisdiction of the courts located within the county of New York in the State of New York, and you hereby submit to the personal jurisdiction of such courts. Except as provided above, (i) the English courts will have exclusive jurisdiction over any claim arising from, or related to, a visit to our Site although we retain the right to bring proceedings against you for breach of these Terms and Conditions in your country of residence or any other relevant country and (ii) these Terms and Conditions are governed by English law.